The naming by the Indonesian Democratic Party of Struggle (PDI-P) of Jakarta Governor Joko “Jokowi” Widodo as its presidential candidate has received the full and sincere support of Deputy Governor Basuki “Ahok” Tjahaja Purnama and city officials. Ahok said he, personally, supported Jokowi’s presidential candidacy because Jokowi was a qualified, competent future leader. Should Jokowi be elected to the country’s top job, Ahok would succeed him as governor of Jakarta. “I think whoever wants to fix this country — especially if they have a reliable track record — will be a good president. I feel obliged to support him,” Ahok said while watching news reports on Jokowi’s presidential candidacy on television in his office at City Hall on Friday. He said he had spoken to the governor about his possible candidacy earlier that morning, however, Jokowi had said nothing was confirmed, as it all depended on PDI-P chair Megawati Soekarnoputri. Ahok said he wondered whether Jokowi planned take leave of duty for the campaign period or if he would resign. “I told him to take leave if possible. I am not undermining his chances. I would just prefer it that way because we can still coordinate via telephone,” he said. Ahok said he was confident City Hall would run “as usual” during the campaign season because Jokowi had already delegated various responsibilities to himself as well as other administration officials. He said he would update the governor with reports and consult him when he had doubts. A number of agency heads were surprised by the news, but they were upbeat and promised to fully support his nomination. “I am proud to hear that our governor is a presidential hopeful. On the one hand, Jakarta actually still needs him, but on the other, he will have the opportunity to serve the nation,” head of the Jakarta Employment Agency I Made Karmayoga told The Jakarta Post over the phone. He commended Jokowi for the changes he had set in motion at the Jakarta administration, such as bureaucratic reforms and changes to the human resources system. Head of the Tourism Agency Arie Budiman said he hoped Jokowi would continue his consistency should he be elected president. “A president who has an experience with Jakarta will have empathy [...] Some city programs may be accelerated because he can ask the ministries to support Jakarta,” he told the Post. Politician from the National Mandate Party (PAN) Wanda Hamidah said she was not surprised when she heard about Jokowi’s candidacy. “It was predictable. 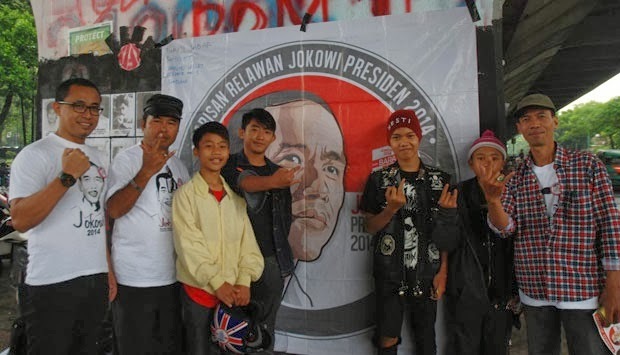 Ideally, the governor should ask Jakartans whether or not they support his presidential candidacy. Hopefully, the people can let him go,” she said. She said she had hoped Jokowi would finish his term and perhaps run for a second term, but his candidacy had good momentum this year. “If we talk about presidential candidates, we have to look at other candidates. If the other options are Prabowo or Ical, I will still choose Jokowi,” she said, referring to Gerindra Party chief patron Prabowo Subianto and Golkar chairman Aburizal Bakrie. The announcement of Jokowi’s nomination came as a complete surprise to City Council PDI-P faction deputy chairman Prasetyo Edi Marsudi, who had assumed the nomination would be announced the week prior to the legislative election. He said his fraction was behind the nomination. “Congratulations to Pak Jokowi. This is the best news for all of us,” he said.